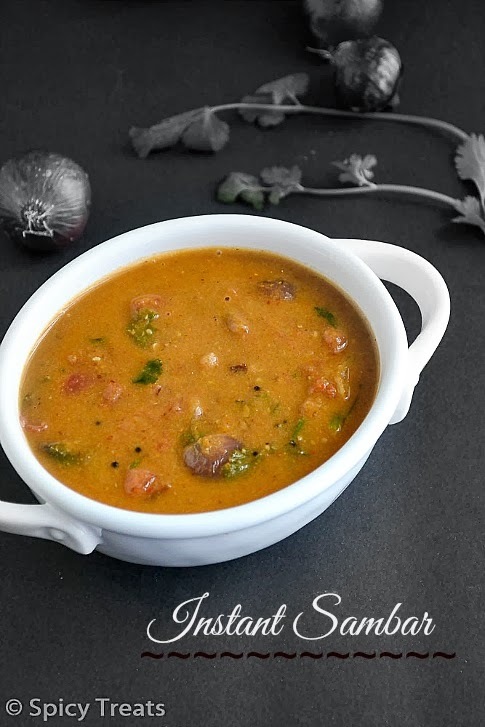 Instant Sambar / Pottukadalai Sambar is a quick and instant sambar that does not need lentils/dal and can be made in a jiffy. This Instant sambar pairs well with all the South indian breakfast items Idli, Dosa, Pongal, Medhu vada, Upma, Paniyaram. Long back saw this recipe from Jeyashri's Kitchen and this is my family favorite sambar and have been cooking this every weekend for Pongal or idli but this time only got time to take pictures. 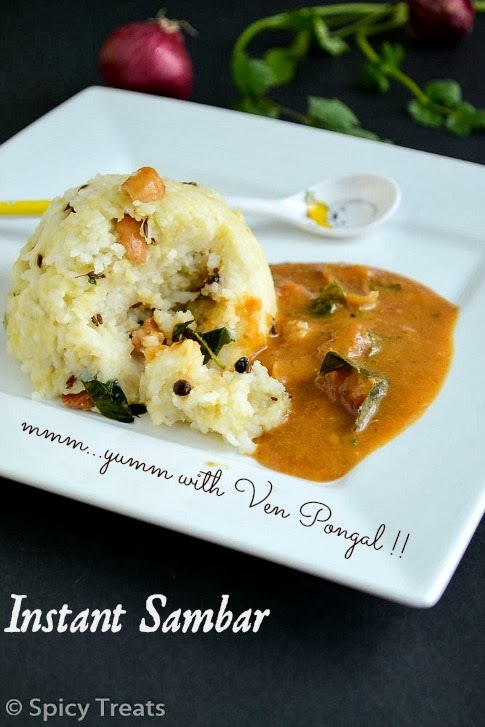 comes handy and most of our /Saturday's breakfast will be Ven Pongal and this Instant Sambar. Even On this New year's day i prepared this sambar and clicked picutres. 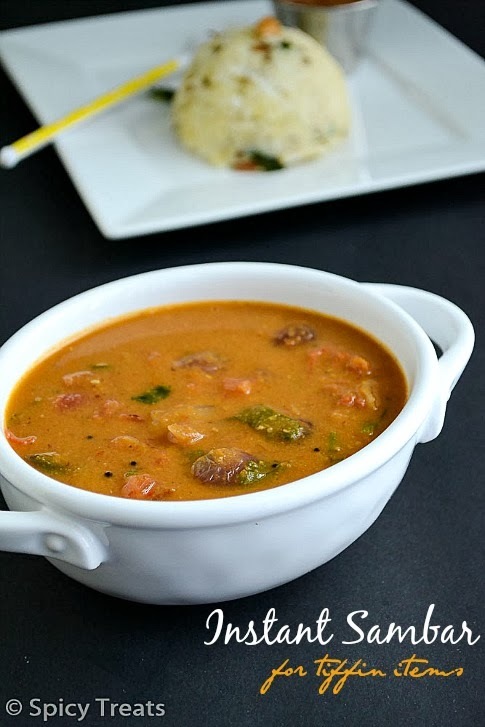 So if you are looking for a quick side dish for idli/venpongal without comprise in taste and flavor of your traditional favorite sambar then this is one best recipe. Heat oil in a pan, and roast dry red chilli, corainder seeds, curry leaves for few seconds then add onions and tomato saute for 1-2 minutes. Then allow to cool for a while and grind it along with pottukadalai and couple of tbsp of water to a smooth paste and keep aside. Now heat oil in a pan, when its heated add mustard seeds and allow to pop and then add curry leaves and onions and saute for 1-2 minutes. Then add tomato saute it and then add the ground paste saute for few seconds and add enough water, salt and stir well. (make it little thin, as it thickens after boiling). And then, stir well and allow to boil in medium heat. After boiling and the raw smell leaves, finally add some chopped cilantro and turn off the stove. That's it...Instant Sambar ready. 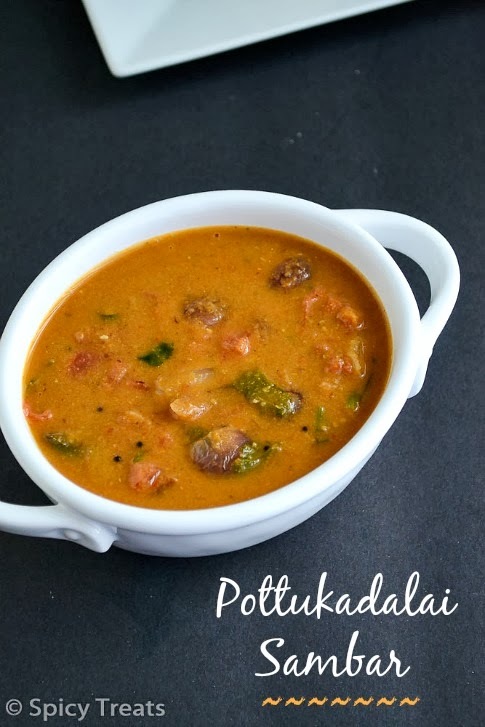 Serve hot with idli or Pongal. I even like this sambar with white rice. If you are adding veggies to this sambar, chop them finely or small pieces since this sambar gets cooked so fast. And add the veggies along with tomato and saute for a minute then add the ground paste. If you like you can also add tamarind paste (1/4 tsp dissolved in 1/4 cup water) to the sambar but i felt bit tangy when tamarind added. the tanginess from the tomato itself fine to us. So i do not add tamarind to this sambar. Sambar onions or pearl onions or chinna vengayam give nice taste and flavor but with regular onion also this sambar tastes great. Anyways, Sambar looks delicious and comforting.. Nice clicks, as always.. Very nice recipe sangeetha! Lovely clicks! 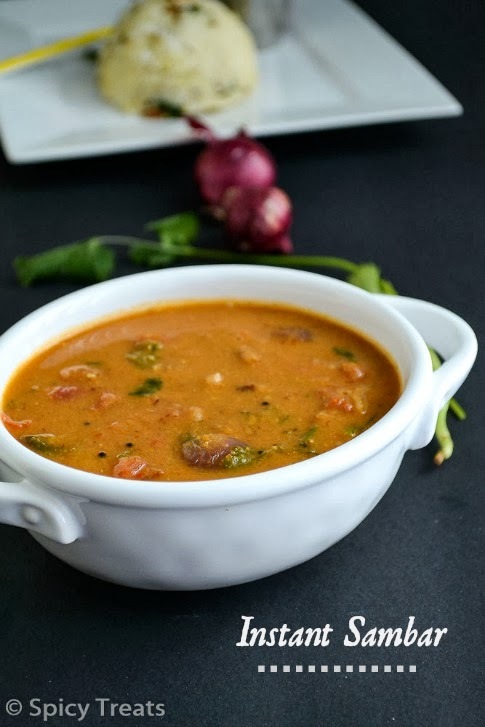 easy to make healthy sambar. Yumm. Wow i never knew this will try soon.Last click looks super. super yummy sambar.. and what a combo!.. I always make this version. I find it quick and easy. yummmm !!! just cudnt take my eyes off that last picture...u really caught me there !!!! very interesting recipe. 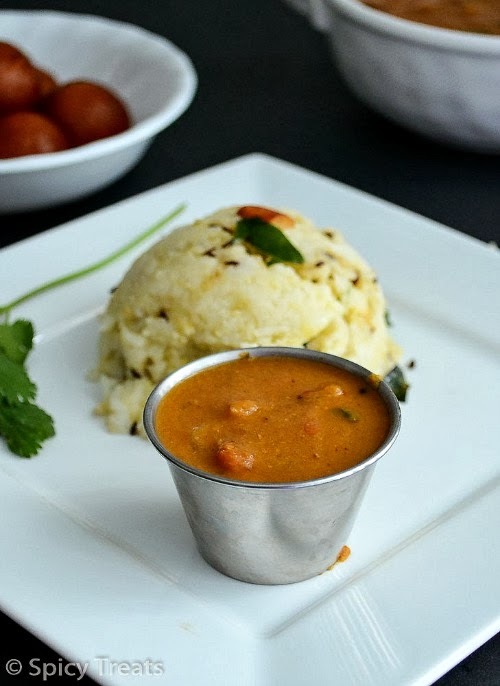 Sambar looks delicious, am going to definitely try this..
Lovely and delicious looking sambar. I love sambar and these look so good. Wow instant sambar new to defnietly try this now.Thank u so much for the recipe. Roasted gram dal or Dalia!